An excellent directional debut from Bradley Cooper, A Star is Born captures both the joy and agony of what it is to be human. 1937, 1954, 1976, 2018. As a cinematic property, A Star is Born has been reimagined on several separate occasions, under a variety of guises, but the fundamental story has always remained the same. As one star rises, another begins to crumble. It is this essence that has ensured its longevity, with themes that can always be adapted and updated even as the years continue to pass. Originally envisioned as a Beyoncé vehicle with Clint Eastwood in the director’s chair, this latest remake stalled in development hell for a number of years before inspiration arrived from an unlikely source. Bradley Cooper, who shot to fame for his role in The Hangover series, stepped on board the project with gusto and assumed essentially every responsibility, acting as director, co-star, producer and co-writer, as well as having significant involvement in the writing and production of the film’s soundtrack. A Star is Born feeds off his passion. This is a touching, human piece that is bound to do well come awards season, with Cooper’s direction, performances by both leads and the music all worthy of acclaim. It opens with a live performance. Which is fitting, as the film’s loose structure is signposted by the implications of performance. As rock/country singer Jackson Maine (still packing stadiums despite fatigue), Cooper is instantly believable as a rockstar – both in look and sound. A Star is Born has some of the most authentic music performances in recent cinema. These live shows feel real, not only because they were filmed with help from the likes of Willie Nelson and Glastonbury Festival, getting Cooper access to the stage, but also because of his intimate direction. In these moments you become lost in the hypnotic grasp of the artist, mesmerised by the visceral talent that both Cooper and Gaga display. Matthew Libatique’s cinematography, up close and personal, captures the sweat and tears. These onstage sequences are alive, moving to a beat we can all latch onto. When seeking an easy drink, Jackson, a proper alcoholic’s alcoholic, stumbles upon Gaga’s Ally in a drag bar. Performing “La Vie en Rose”, she completely captures his attention, ours too, and a relationship quickly blossoms. Their chemistry is natural, though the underpinnings of tragedy show early on. Jackson sees the talent in her that others have refused to accept, encouraging Ally to perform one of her own songs with him at a gig. What follows is one of the most affecting scenes of the year thus far. 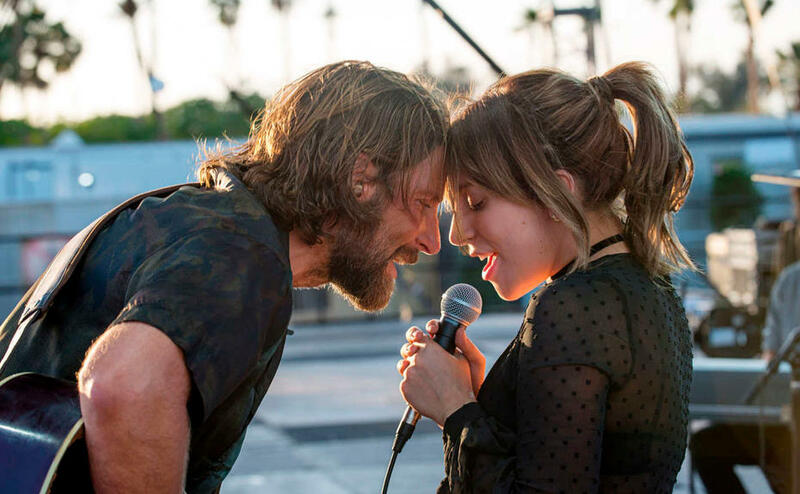 Cooper and Gaga’s rendition of “Shallow” (written by Gaga and Mark Ronson among others) is a microcosm of the whole film. A genuine tear-jerker, this performance represents a underlying human desire; it’s what we all want in life, the platform and courage to achieve our dreams. “Shallow” itself is a proper ballad, a showcase of a stellar soundtrack. Other highlights include “Maybe It’s Time”, a longing, sentimental tune that feels perfect for Cooper’s character, and “Always Remember Us This Way”, but as a whole it comes together beautifully. If you didn’t know already, Lady Gaga is a musical force, a special talent and one of few current artists who will be looked back on with reverence. After a few campy roles in American Horror Story and the Sin City sequel, she’s now shown she can act for real. As Jackson begins to lose himself, his addictions taking hold, Ally morphs into a more Gaga-like figure. YouTube videos, Saturday Night Live and a flashy section at the Grammys set the action firmly in the present – you wonder whether the impact of global warming and AI will play a part come A Star is Born 2049. Strangely, the film appears to have a slightly snobby attitude towards pop music. Jackson seems to hit the bottle harder after seeing Ally perform the sort of music that Gaga is renown for, suggesting she has sold out. This could just be pointing towards how out of touch Jackson is, rather than an attempt to convey the superiority of country and rock to pop, yet it sits a little uneasy. Otherwise, there’s solid support from Andrew Dice Clay, Dave Chappelle and particularly Sam Elliott. Elliott, as Jackson’s similarly tortured elder brother Bobby, is the vocal template for Cooper, who has impressively brought his pitch down dramatically to match Elliott’s gruff drawl. There are times where you struggle to make out what either is saying. Nonetheless, there’s engagement in the backstory of their fractured relationship, providing closure with emotional wallop. Elliott should be in awards contention alone for a single facial expression, pulled when reversing out of Jackson’s driveway after a poignant discussion. A Star is Born is a love story saturated with emotion. If you buy the romance, you’ll buy the emotion. It’s so affecting that come the 2-hour mark there’s risk of mental drain. Here it loses itself a bit, with a tragic conclusion that perhaps doesn’t hit as hard as it should. Abiding with all the previous films, it can’t have a happy ending – The Greatest Showman, this ain’t. It just might have been refreshing if Cooper had opted for a more subtly bleak denouement. However, you can’t really complain when Gaga brings the house down in a way very few could. A Star is Born (2018), directed by Bradley Cooper, is distributed in the UK by Warner Bros Entertainment, certificate 15.